Emil Michael is one of Silicon Valley’s most visionary and strategic business leaders. Michael played a leading role in the successful development of three prominent tech companies including as Chief Business Officer at Uber, the Chief Operating Officer of Klout and a founding member of Tellme Networks. He is currently an advisor at Coatue Management, a technology sector investment fund. Michael has unique perspective based on his experience and understanding of technology at both a product and engineering level, allowing him to partner with technical to ensure synchronicity with company’s business goals. 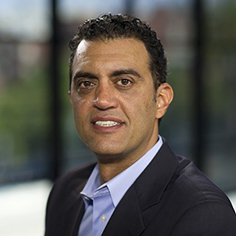 Michael, a native of Egypt, began his career at Gemini Consulting's Converging Markets Laboratory. He later joined the Communications, Media and Entertainment Investment Banking Group at Goldman Sachs, where he worked until 1999. From 1999 until 2008, Michael was an executive at Tellme Networks, a pioneer in speech recognition technology, leading the company through the technology bust of 2000 and building the business into a profitable enterprise that was acquired by Microsoft in 2007 for approximately $800 million. During the Obama administration, Michael was named a White House Fellow, serving at the Pentagon as a Special Assistant to U.S. Defense Secretary Robert Gates. In 2012, Michael was appointed Chief Operating Officer of Klout, and joined its Board of Directors. In September 2013, Michael joined ride sharing start-up, Uber. Overseeing its rapid business development, Michael led the company’s expansion into China and Russia, which resulted in over $70 billion in market value creation. He was pivotal in raising nearly $15 billion in capital from investors and he struck partnerships with some of the world’s largest companies, including American Express, AT&T, Softbank and Toyota. His public service at the Defense Department inspired him to develop UberMilitary, a program designed for veterans and their families. The program currently has over 100,000 participants who have earned over $340 million. Uber is now one of the world’s most valued private technology companies and raised the most money of any private start-up in history. Michael serves as a leadership coach and advisor in over 20 start-ups around the world furthering his commitment to helping the next generation of young CEO’s build and scale. His investments include Bird, Codecademy, Docker, GoEuro, GoPuff, SpaceX and Stripe.